You never know where recipe inspiration may come from. A few Sundays ago as I was trying to think of a new macaroni and cheese recipe, I was stuck. I knew I was going to use Wisconsin Smoked Gouda Cheese, but as for everything else, I just didn’t know. Did I want a Tex-Mex mac ‘n cheese with charred poblanos? Or how about a hog-wild American version with bacon and caramelized onions? 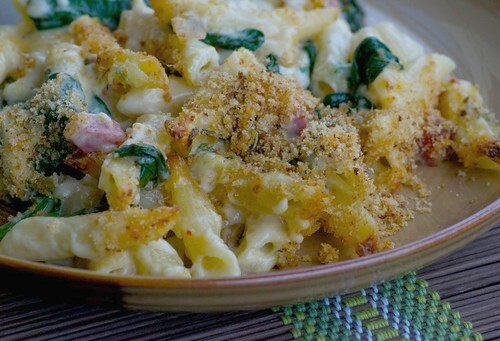 Click here to find out what happened next and to get the recipe for Salami, Spinach, and Smoked Gouda Macaroni and Cheese. For 29 more amazing macaroni and cheese recipes from some of the best food bloggers out there, please visit The 3rd Annual 30 Days, 30 Ways with Macaroni and Cheese web site, sponsored by the Wisconsin Milk Marketing Board. May I come over for dinner? 30 Days and 30 ways, huh? I'd be one very happy guest! I adore smoked gouda, it's one of my favorite cheeses. What a great idea to use it in mac and cheese. Holy cow. Well, I'd be an even bigger one after 30/30. Carb craving comeing soon here. Inspiration can come from the funniest places. And I'd say that this flavor combination is definitely inspired! Holy Macaroni! I love the salami combo with the Gouda. Decadent!